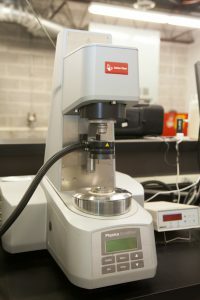 The Binder Lab at Interstate Testing Services is one of the most well-rounded liquid asphalt labs in the country. The Binder Lab at Interstate Testing Services is one of the most well-rounded liquid asphalt labs in the country. Our technicians use state-of-the-art equipment and technology to test PG binders, emulsions and cutback binders for contractors, agencies and refineries. We offer many other specialized testing capabilities; contact ITS for pricing and a full list of our services. Our 7,000 sq. ft. ITS facility houses the newest technologies and equipment for testing emulsions, cutbacks, RAP, RAS and PG liquid. Interstate Testing Services knows that receiving results quickly is important in the asphalt and construction industry. Our technicians are able to provide a quick turn-around and deliver test data with accuracy and timeliness.